Tuscan (dialetto toscano [di.aˈlɛtto toˈskaːno; dja-]) is an Italo-Dalmatian variety mainly spoken in Tuscany, Italy. Standard Italian is based on Tuscan, specifically on its Florentine dialect. Italian became the language of culture for all the people of Italy thanks to the prestige of the masterpieces of Dante Alighieri, Petrarch, Giovanni Boccaccio, Niccolò Machiavelli and Francesco Guicciardini. 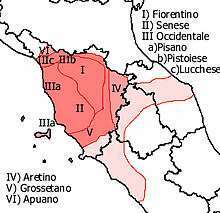 It would later become the official language of all the Italian states and of the Kingdom of Italy when it was formed. Dialects and Languages of Italy by groups (Tuscan dialect group in light azure). Tuscan is a dialect complex composed of many local variants, with minor differences among them. The main subdivision is between Northern Tuscan dialects and Southern Tuscan dialects. Fiorentino, the main dialect of Florence, Chianti and the Mugello region, also spoken in Prato and along the river Arno as far as the city of Fucecchio. Pistoiese, spoken in the city of Pistoia and nearest zones (some linguists include this dialect in Fiorentino). Pesciatino or Valdinievolese, spoken in the Valdinievole zone, in the cities of Pescia and Montecatini Terme (some linguists include this dialect in Lucchese). Lucchese, spoken in Lucca and nearby hills (Lucchesia). Versiliese, spoken in the historical area of Versilia. Viareggino, spoken in Viareggio and vicinity. Pisano-Livornese, spoken in Pisa and in Livorno and the vicinity, and along the southern coast as far as the city of Piombino. Aretino-Chianaiolo, spoken in Arezzo and the Valdichiana. Senese, spoken in the city and province of Siena. Grossetano, spoken in the city and province of Grosseto. Corsican on the island of Corsica, and its variety spoken in Sardinia, are classified by scholars as a direct offshoot from medieval Tuscan. 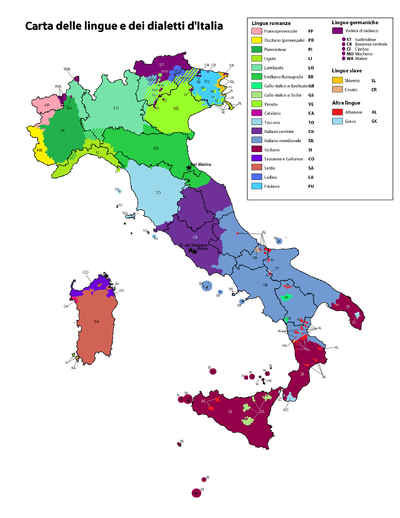 Excluding the inhabitants of Province of Massa and Carrara, who speak an Emilian variety of a Gallo-Italic language, around 3,500,000 people speak the Tuscan dialect. The Tuscan dialect as a whole has certain defining features, with subdialects that are distinguished by minor details. A phonetic phenomenon is the intervocalic weakening of the Italian soft g, the voiced affricate /dʒ/ (g as in George) and soft c, the voiceless affricate /tʃ/ (ch as in church), known as attenuation, or, more commonly, as deaffrication. This phenomenon is very evident in daily speech (common also in Umbria and elsewhere in Central Italy): the phrase la gente, 'the people', in standard Italian is pronounced [la ˈdʒɛnte], but in Tuscan it is [la ˈʒɛnte]. The sequence /la ˈtʃena/ la cena, 'the dinner', in standard Italian is pronounced [la ˈtʃeːna], but in Tuscan it is [la ˈʃeːna]. As a result of this weakening rule, there are a few minimal pairs distinguished only by length of the voiceless fricative (e.g. [laʃeˈrɔ] lacerò 'it/he/she ripped' vs. [laʃʃeˈrɔ] lascerò 'I will leave/let'). A less common phonetic phenomenon is the transformation of voiceless s or voiceless alveolar fricative /s/ into the voiceless alveolar affricate [ts] when preceded by /r/, /l/, or /n/. For example, il sole (the sun), pronounced in standard Italian as [il ˈsoːle], would be in theory pronounced by a Tuscan speaker [il ˈtsoːle]. However, since assimilation of the final consonant of the article to the following consonant tends to occur in exactly such cases (see "Masculine definite articles" below) the actual pronunciation will be usually [i ssoːle]. Affrication of /s/ can more commonly be heard word-internally, as in falso (false) /ˈfalso/ → [ˈfaltso]. This is a common phenomenon in Central Italy, but it is not exclusive to that area; for example it also happens in Switzerland (Canton Ticino). There are two Tuscan historical outcomes of Latin ŏ in stressed open syllables. Passing first through a stage [ɔ], the vowel then develops as a diphthong /wɔ/. This phenomenon never gained universal acceptance, however, so that while forms with the diphthong came to be accepted as standard Italian (e.g. fuoco, buono, nuovo), the monophthong remains in popular speech (foco, bono, novo). A characteristic of Tuscan dialect is the use of the accusative pronoun te in emphatic clauses of the type "You! What are you doing here?". Tuscan: Te lo farai, no? A morphological phenomenon, cited also by Alessandro Manzoni in his masterpiece "I promessi sposi" (The Betrothed), is the doubling of the dative pronoun. In some dialects the double accusative pronoun me mi vedi (lit: You see me me) can be heard, but it is considered an archaic form. The singular and plural masculine definite articles can both be realized phonetically as [i] in Florentine varieties of Tuscan, but are distinguished by their phonological effect on following consonants. The singular provokes lengthening of the following consonant: [i kkaːne] 'the dog', whereas the plural permits consonant weakening: [i haːni] 'the dogs'. As in Italian, masc. sing. lo occurs before consonants long by nature or not permitting /l/ in clusters is normal (lo zio 'the uncle', lo studente 'the student'), although forms such as i zio can be heard in rustic varieties. A morphological phenomenon found throughout Tuscany is the personal use of the particle identical to impersonal si (not to be confused with passive Si or the reflexive Si), as the first person plural. It is basically the same as the use of on in French. It's possible to use the construction Si + Third person in singular, which can be joined by the first plural person pronoun Noi, because the particle "si" is no longer perceived as an independent particle, but as a piece of verbal conjugation. Usually Si becomes S' before è. Another morphological phenomenon in the Tuscan dialect is what might appear to be shortening of first singular verb forms in the present tense of fare (to do, to make) and andare (to go). These forms have two origins. Natural phonological change alone can account for loss of /d/ and reduction of /ao/ to /o/ in the case of /vado/ > */vao/ > /vo/. A case such as Latin: sapio > Italian so (I know), however, admits no such phonological account: the expected outcome of /sapio/ would be */sappjo/, with a normal lengthening of the consonant preceding yod. What seems to have taken place is a realignment of the paradigm in accordance with the statistically minor but highly frequent paradigms of dare (give) and stare (be, stay). Thus so, sai, sa, sanno (all singulars and 3rd personal plural of 'know') come to fit the template of do, dai, dà, danno ('give'), sto, stai, sta, stanno ('be, stay'), and fo, fai, fa, fanno ('make, do') follows the same pattern. The form vo, while quite possibly a natural phonological development, seems to have been reinforced by analogy in this case. A phonological phenomenon that might appear to be a morphological one is the loss of the infinitival ending -re of verbs. An important feature of this loss is that main stress does not shift to the new penultimate syllable, as phonological rules of Italian might suggest. Thus infinitive forms can come to coincide with various conjugated singulars: pèrde 'to lose', pèrde 's/he loses'; finì 'to finish', finì 's/he finished'. In practice this homophony seldom, if ever, causes confusion, as they usually appear in distinct syntactic contexts. The fixed stress can be explained by supposing an intermediate form in -r (as in the Spanish verbal infinitive). While the infinitive without -re is universal in some subtypes such as Pisano-Livornese, in the vicinity of Florence alternations are regular, so that the full infinitive (e.g. vedere 'to see') appears when followed by a pause, and the clipped form (vedé) is found when phrase internal. The consonant of enclitics is lengthened if preceded by stressed vowel (vedèllo 'to see it', portàcci 'to bring us'), but not when the preceding vowel of the infinitive is unstressed (lèggelo 'to read it', pèrdeti 'to lose you'). The biggest differences among dialects is in the lexicon, which also distinguishes the different subdialects. The Tuscan lexicon is almost entirely shared with standard Italian, but many words may be perceived as obsolete or literary by non-Tuscans. There are a number of strictly regional words and expressions too. codesto (literary form in standard Italian) is a pronoun which specifically identifies an object far from the speaker, but near the listener. ↑ "Ali, Linguistic atlas of Italy". Atlantelinguistico.it. Retrieved 2013-11-22. ↑ Linguistic cartography of Italy by Padova University Archived May 6, 2008, at the Wayback Machine. ↑ "Italian dialects by Pellegrini". Italica.rai.it. Retrieved 2013-11-22. ↑ "Risposte ai quesiti" (in Italian). Retrieved 9 December 2010.